Phillips Collection is always making a statement with their market-driven execution of innovative new concepts. Many of the pieces have been sourced and derived in very sustainable and eco-friendly ways across seas to transform obscure materials and create beautiful, functional art and furniture for interiors. While most of your designs cater to interiors, whether residential or commercial, the exteriors of your projects are the gateway into your hard work and demand just as much love. Phillips Collection has mastered the elements to turn some of their most fashionable furniture into weather-friendly, outdoor pieces. Here are our favorites to make the great outdoors even greater. The Copper Acid Collection’s unique colors and patterns can only be achieved with a finish of genuine copper. 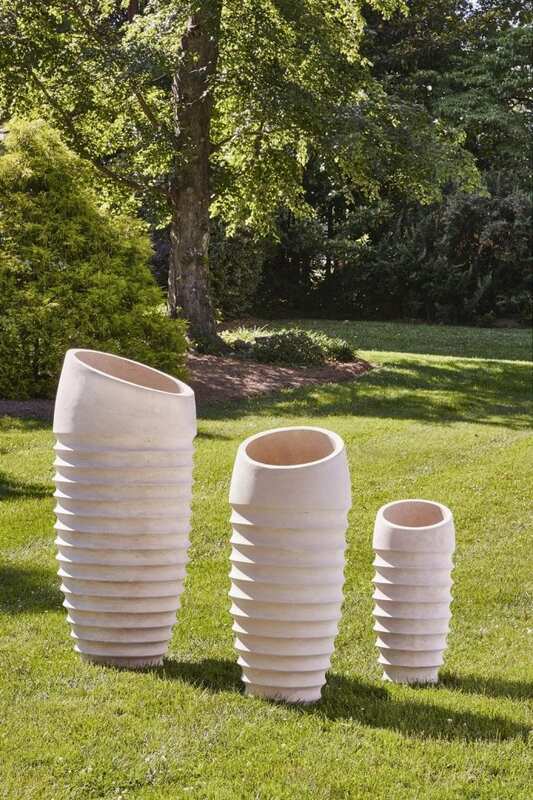 But our sculptural forms are made with a material that is lightweight, durable and water-resistant. The natural chemical compositions of the Lichen finish are used in order to induce pattern, color and variation in the finish. Once finished, a clear finish sealer is applied to create the stunning look. From the form to the finish, each one of our accessories is thoughtfully designed. Made from artisan-grade resin, this sculptural piece will excite any environment. Surprise is the most important element of design in the Seat Belt seating collection. These unique chairs are created by hand-weaving industrial seat belt material over a frame. Stylish, innovative and extremely comfortable, Seat Belt is available in a range of forms and colors. Often accused of being flattened eggs, Phillips Collection’s river stone tables were inspired by a trip to the Ayung River in Indonesia. The smoothed stones in the crystal clear water inspired a collection born from nature. Oversized yet low in profile, the River Stone tables are available in many finishes. The gel coat finish is super-durable and has the color going all the way through the piece, ensuring any scratches or chips over the years will not be noticeable. These beautifully polished pieces are bringing the garden a modern twist and are sure to make any space more glamorous. The Phillips Collection began as purveyors of fine Eastern art and artifacts. These exquisite reproductions speak directly to that history, and seek to provide the same inspirations for a new era. Beautiful, authentic and meaningful. The Yoga Figures are crafted out of a strong artisan grade resin and finished with a polished bronze coating. They are displayed on a beautiful circular base which complements the organic nature of human of this sculptural design. These Yoga Figures in tree pose will inspire and add energy to any space. Cast from actual tree stumps, the Roman tables and stools are a great way to blend into nature and are available in many finishes.